Finally. 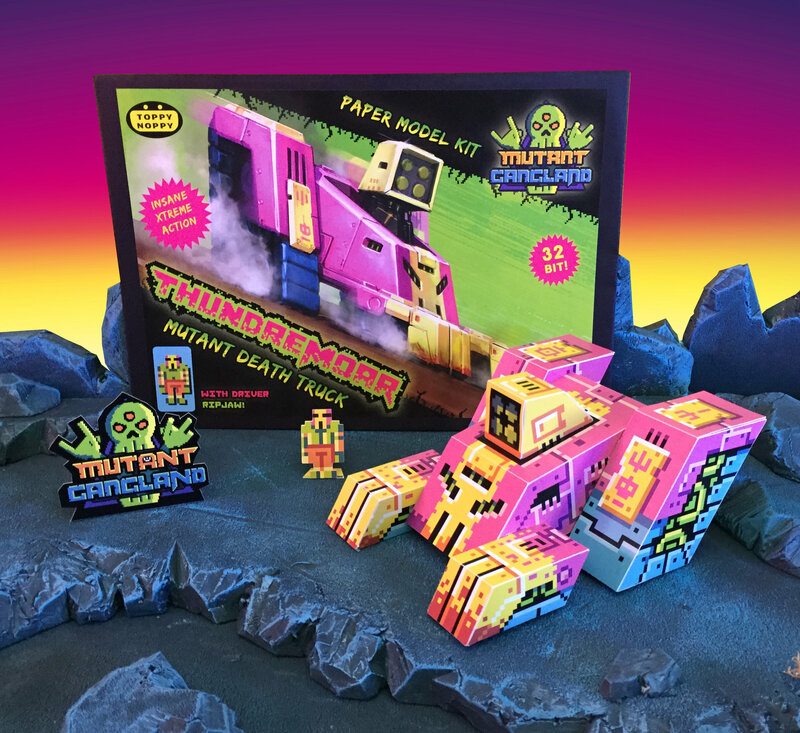 Paper model kit Thundremoar is out! It’s my biggest (and admittedly second) paper project so far and I am very happy with it. Let’s take a look. When designing the package I got the chance to let go of restraints and dive into the xtreme 90s. Here ‘too much’ and ‘too loud’ are a virtue. It was an outlet for my nostalgia. Young me always stood in toy stores gazing at toy boxes. I soaked up a lot of imagery and it’s all coming out. The art had to be done by someone who was very good at tanks and robots and that dude was Ksen. At first I was anxious for the result because I have difficulty letting go of control but the result blew my socks off. The early decision to make the toy twice as large as originally intended paid off. It’s hard to communicate how huge (the size of a hand?) it is but it just feels powerful. I think people will be surprised by that. All pre-orders have been shipped and I’m curious about the reception. Of the two versions pink seems to be the favourite by around 70%. These are my babies so I will obviously say I love them both equally but yes pink is my favorite. Price slashing code “THUNDRELESS’ still counts and you can get Thundremoar here. 2015 and how I need to change as an artist. 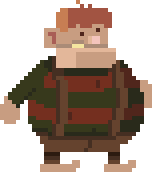 Releasing Penarium was as far as I planned 2015. Well. That happened and a whole lot more. Here’s what went down this year and what is going to change in 2016. The biggest one being a major shift in focus as an artist. First off. I beat Game Developers Conference this year. I say that because the one the year before was not a good trip for me at all. First time in San Francisco, First time at a big convention, First time I had a game to hustle. After that trip I wrote down everything that bugged me and learned from it. GDC 2015 was bliss. Mostly because I stopped giving a crap. I became free and I could start being myself. I visited Japantown which has a papercraft store. Everywhere around me were magnificent sculptures of origami and other techniques. What caught me were little robots made from folded straws, which were called Piperoids. It fascinated me that you could make figures out of paper. A few months later we finished and released Penarium. What a relief. Finally a game I can tell my family about. “What do I do?” I make games. Just look at your Playstation uncle Benny. Yes it’s done. It’s finally done. The game’s on there. Despite its somewhat low sales I am proud about the fact I worked in a team and we finished a game. I still can’t live off games but we made a game the way we wanted to. Many reviews were positive, some of them were negative but we delivered. Now what? A friend of mine asked me “What do you ultimately want to achieve as a game maker?” I never heard that question before. Not even from myself. I was caught surprised but I was even more surprised by how fast I came up with a focused answer: To make a game and a world of which people will say “That’s his game”. That’s the next step after Penarium and it’s a battle I’ve been fighting for years. The closest I got to it was Mutant Gangland. This is the year me and Zapa stopped development on Mutant Gangland, A turn-based strategy game that looks like a mix between Advance Wars and Ninja Turtles. Last year we put it in early access and sold a few copies. It became a game where I could unload my love for wacky action figures and comics. Mostly those of Toxic Crusaders and Ninja Turtles. Then Zapa got busy. Actually, He got a day job. Without a programmer the game was dead in the water. A shame because I grew attached to the wasteland world I created. I closed the door on yet another game. This happened to me too often. Months later I read a Turtles comic and was reminded by how full of juvenile energy it is. I wanted to recreate that energy so I contacted Zapa. After a good talk he gave me the freedom to whatever I wanted with Mutant Gangland. It was now 100% mine. It just wasn’t done yet. far from it. But the door was open again. 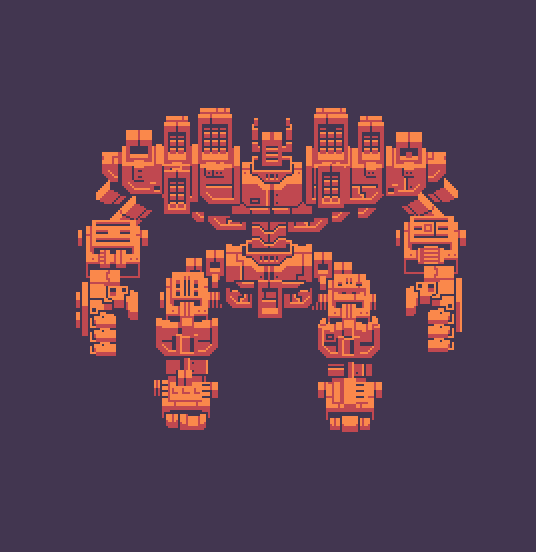 I want to release Mutant Gangland one day. Release that game with my world in it. Give the people what they paid for. It bugs me every day that I have not yet delivered but it will be done. The real question is what kind of game it will be. After talking to some developers I discovered I simply did not have the funds to make a complete turn based strategy game. However; With the world I created I wouldn’t have to. It could be whatever as long as it’s a good vehicle for cool looking characters and a compelling setting. And the visual style? I’m strongly pondering that subject. 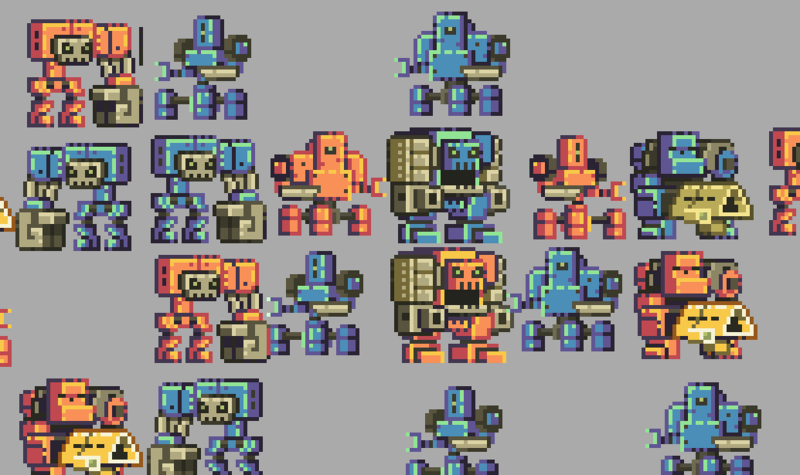 Right now Mutant Gangland is pure pixel art and I’m tired and wary of using pixel art. Years ago during a internship at a mobile games company I started doing pixel art and I’ve been using it ever since. What appealed to me about it was its satisfying learning curve. Once I understood the rules it was even more fun to do. I did several pixel art projects over the years while growing slowly. This to a point I wouldn’t even question the use of it. That autopilot is a bad situation. There’s been some talk among the Penarium team about wether a non-pixel art 2D style might have helped the game’s reception. There’s no way of telling. Two of this year’s most critically acclaimed games are made of pixelart but I can’t help wondering if Penarium’s style made people put it in a certain corner. You could argue that pixel art is a medium but that’s unfortunate when many consider it a style. It’s associated with retro gaming and deliberate ‘indie’-ness. Maybe people saw Penarium as indie retro platformer nr 3453. 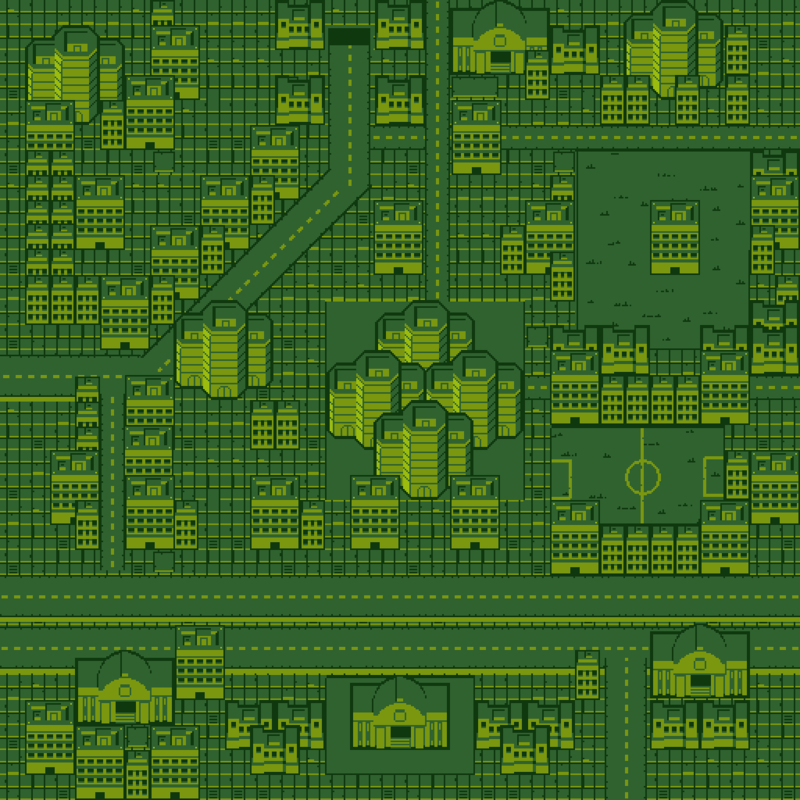 Because Mutant Gangland was inspired on the style of Advance Wars. 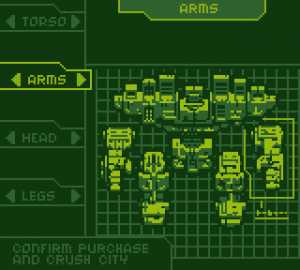 That style started to direct Mutant Gangland’s themes and story. I think it should be the other way around. 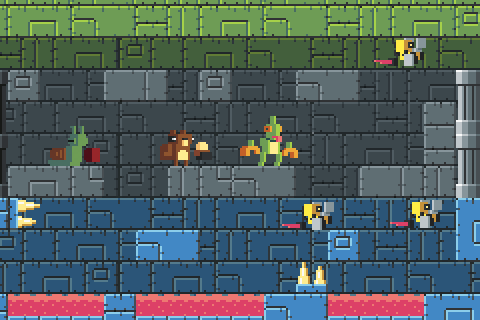 Late 2015 I played around with program called Crocotile which lets you place pixel art tiles in a 3D environment. This seemed like the perfect transition between easily understandable pixel art and the scary world of 3D interfaces. It almost looked like you could fold them because all the tiles have the same sizes. It was just cubes and cubes and cubes. I closed the program. Opened Photoshop. Made some pixel art squares and printed it on a paper. Then I folded and glued them and made this. Something clicked when I assembled that pizza robot. The Piperoids I saw in San Francisco had been brewing in the back of my head for a long time. They got me wondering wether I could start making three-dimensional tangible things myself. I was able to make something without needing a developer, which is my greatest frustration with game making. Also I could make this with all the skills I already possessed. In 2016 I will make a whole street with robots like these. Food vendors called The O-bots. How does this relate to Mutant Gangland? 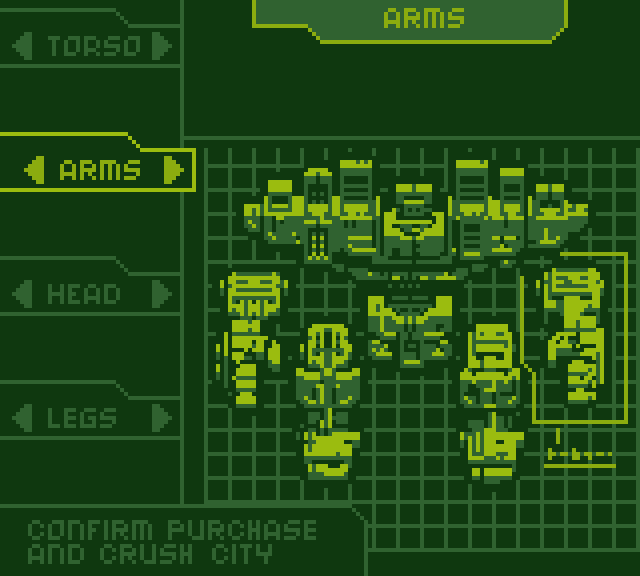 Remember when I said Mutant Gangland’s current style commanded the substance? Let’s flip that. 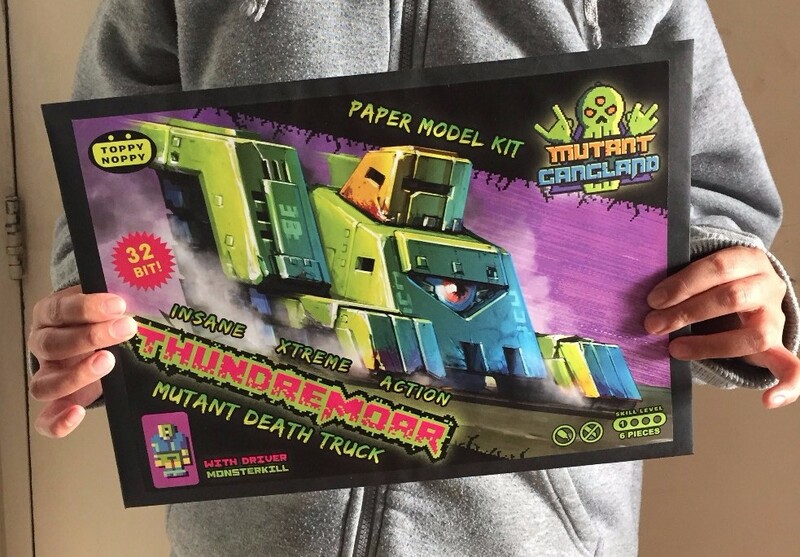 Everything that’s awesome about Mutant Gangland’s made up universe comes from comics and toys. That’s something to consider in 2016. As part of that I want to explore the action figure realm and make Mutant Gangland action figures. That’s my resolution for 2016. For that I will have to learn 3D. Last week I started following a class at my good friends at Reptile. Next year will be full of 3D adventure. Which brings me to the last game I’ll probably do in 2D pixel art. 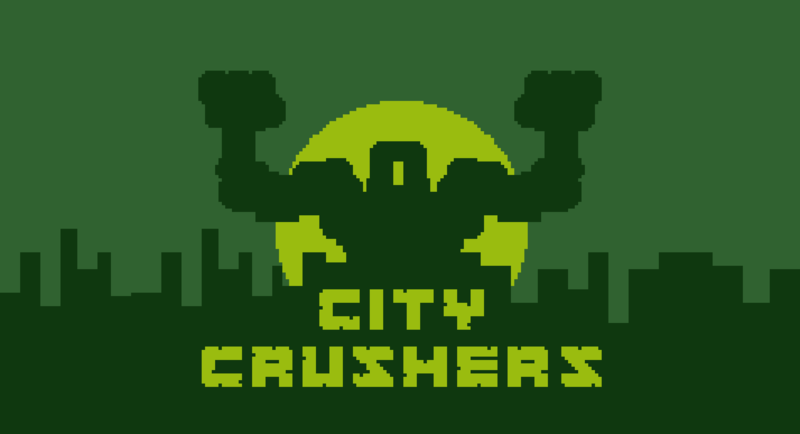 I did some game jamming this year and one in particular stuck out: City Crushers. a time attack game where you play a giant robot crushing cities. Made with Laurent Victorino. When the jam was over I still wanted to finish the game. In 2016 I want to make an expanded version of the game. 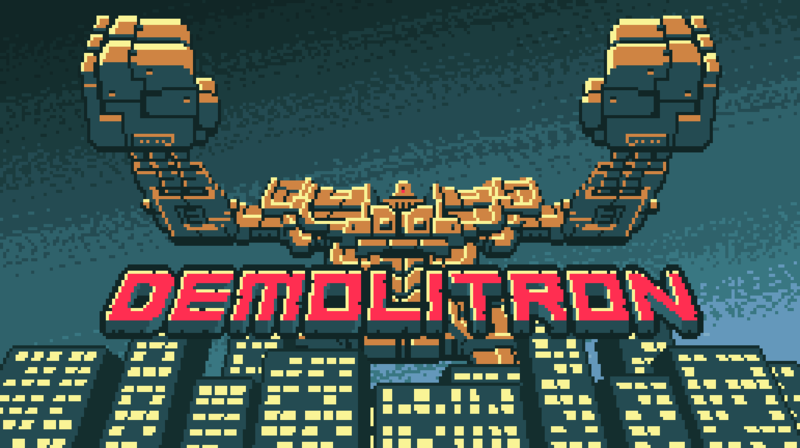 renamed Demolitron.The reason I want to bring this out badly is because even more like Penarium this feels like a concept that came from myself rather than a large team. It’s the next logical step after Penarium. This is also the frst game in a while where I am responsible for the game design. Something I like doing even more than doing game art. Most important of all: I want to BEAT that curse of personal games not getting finished. You might ask yourself why I don’t start learning how to code. I have been learning. I’m also terrible at it. I have some talents and programming is just not one of them. Truth is most of the time my mind is a scrambled mess. A tornado of distractions. There are some activities that manage to hypnotise me away from that tornado. 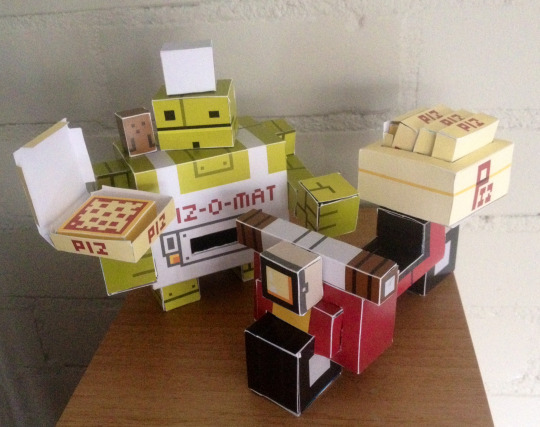 Pixel art was that for me and the same counts for 3D and papercraft. It’s been a good year for me. Having released a game that I am largely responsible for plays the big part in that and I’m proud of just finishing something for once. My resolutions for 2016 may seem silly but it signals a shift in focus. from games to toys, from 2D to 3D, from dependancy to autonomy. 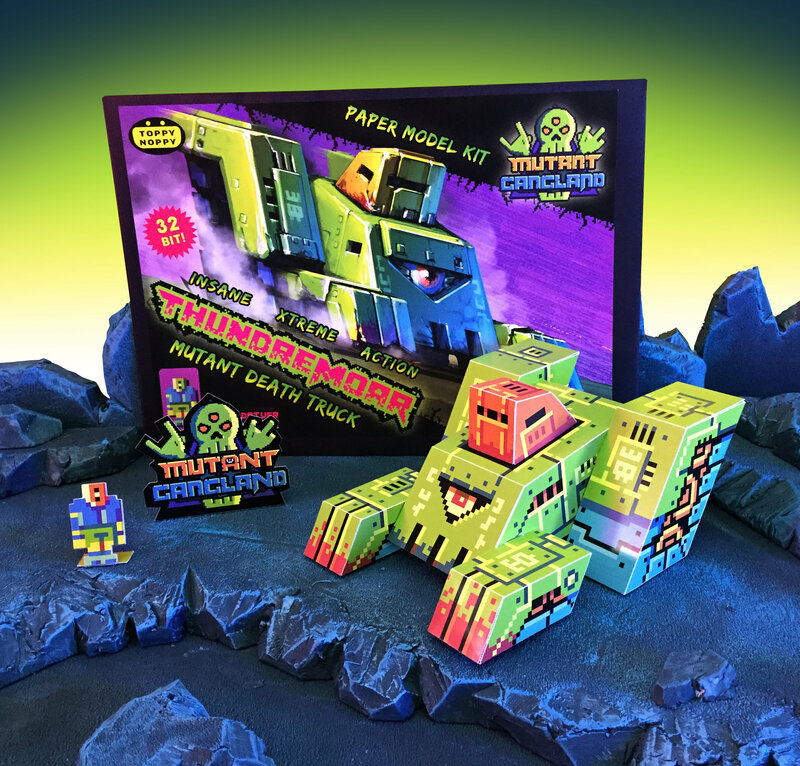 Mutant Gangland and O-bot figures are the most exciting projects ever right now. Something I can do all by myself. Demolitron should also see release.Of course, This is what I PLAN to do. We never really know what life will throw at us. If a nice project comes by I might jump on board. Just like that. ATTENTION: From now on I’ll be doing regular updates about my adventures through emails. These will be more casual and personal. If you want to be on that list then enter your address below. See you in 2016! Do you want to receive email about my adventures? Penarium is out. We spent over two years developing this game. I was the lead artist. It’s time to look back at the artwork and see what I did to illustrate a sadistic circus extravaganza. Two years ago my friends came to me saying they wanted to make a platformer where the player was stuck in one screen. There were no enemies, the player had to dodge all kinds of deathtraps coming from the top and bottom. Also: It was set at the circus. Honestly I wasn’t listening until I heard the word ‘circus’ and then I was instantly on board. I’m a fan of mystery stuff and the circus is one of those places that has existed before most forms of entertainment. The team’s inspiration was a feature film called Felix ‘The Cat, The Movie’. A 80’s cartoon full of experimental stuff. At one point in the movie the protagonist gets trapped into a circus led by an evil wizard. Specifically the audience was something I was told to look at. It’s a ragtag group of creepy soulless figures. The team wanted to see that scary not quite human audience back in the game. I was so on board with this. So on board. At this point there wasn’t even a game title yet. Just a prototype which was an offspring of another prototype. A platformer where the top and bottom parts were constantly changing and where the player had to fight different kinds of enemies. I also made the mockup art for it. But we started from scratch again. Here we were at the start of a huge complex undertaking. A videogame. Our biggest one yet. There were so many things yet to be done. Good thing people are not able to grasp the giant pile of tasks and trials that need to be solved in order to make something like this. I felt no burden at all. I just started at the beginning. So what is the beginning? Colours! Colours decide flavour. At that time I wasn’t very good with colours so I figured I’d get that right first. What colours? There are billions of them. The lead I had was ‘old circus’ and ‘creepy’ so I dug back up a show I loved and had exactly those two ingredients; Carnivale, about a traveling circus in a 1930’s America. There was much to learn from this. We would later on in the project have discussions about what time and place Penarium is set and there is still no consensus. I myself like to place it in 1920’s Romania. There’s no exact science telling you what colours remind people of a certain place or time. I just followed my guts, watched the show and froze the screen when a colour spoke to me. It could have been somewhere in the background. The colour of a tent canvas or a teapot. Then I’d make a ‘note’ of it by making a dot of that colour in Photoshop. Essentially ending with something that is both a palette and a mood board. This is not the scientific way. An important question when doing pixel art is always whether or not to use outline. Having outline can increase visibility but it also flattens the grander picture. In all honesty I can’t remember why I chose to do most of the game without outline. It felt right at the time. When people ask me about my inspiration for Penarium I say ‘Carnivale’ and the Insane Clown Posse . Twelve year old me thought that was the coolest thing. The sinister, occult universe they described in their songs always spoke to me and it stuck. Other games were Redneck Rampage for lovely sky and Blood. Which also had a dark carnival section. And then there was Dik Trom. We wanted to create an unusual hero. One whose juxtaposition between his physique and his athletic performance would create a comical effect. This is a reference to the earliest days of silent movies when a certain genre reigned supreme: slapstick. 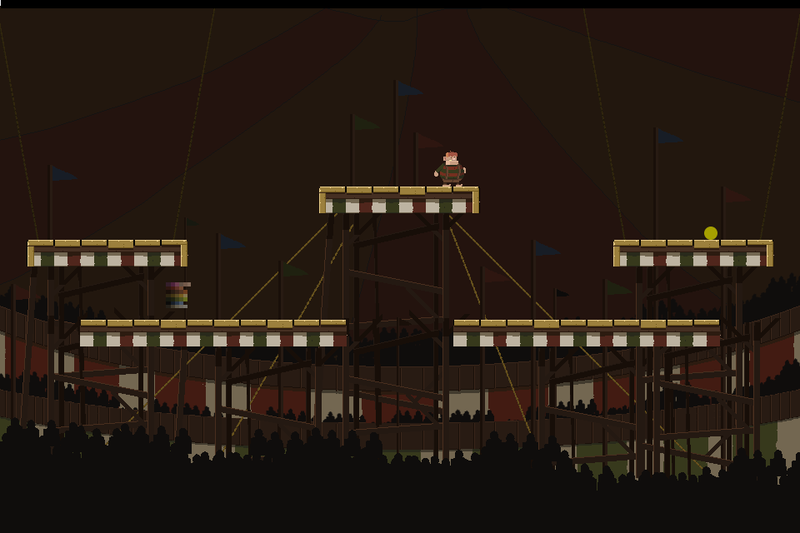 Penarium is what you’d get if Laurel and Hardy was really brutal. In hindsight it’s mean, but at the time plus-sized male characters were more represented in cartoons and movies. Often for comical effect. The heavier person would always be the less agile, less tactile. 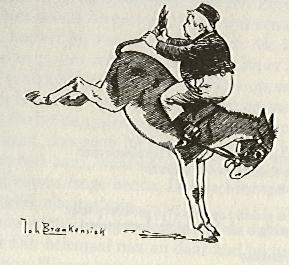 There is however a Dutch book series in which gained popularity is the late 1800’s in which the protagonist was a heavy kid that was always up to shenanigans. This was a big contrast to the then usual obedient characters. His body type was more a display of rebellion than a comedic device at his own expense. I wanted to bring that back in Penarium. But more importantly, we needed a character you felt sympathy for when he would die. There’s lots of dying in this game.Below is my first sprite where I felt we were on to something. I gave him a red hairdo because I have a friend who worked at a circus fair who also had red hair. It’s that simple. My friend’s name is Wilco but we call him Willy. And so the name for the game’s character was born. I also looked at fabric. Denim was still coming in at the time but a brown pair of pants looked more suited for the time. The blue shirt was a colour straight from the palette. The bracer/suspender is a reference to Dik Trom. I used the palette to start working on the background levels. I used wood, rope, canvas. All painted in the washed out dark reds and greens I learned from research. The early drafts were a bit too sinister. I painted a dark dark carnival but the team feared the skulls I made gave players the wrong idea. Another thing I noticed was that it was very hard for me to fill the set resolution space with pixels and that it felt too..mature. The team initially opted for a pixel art style because the gameplay resembled that of brutally unforgiving platformers from the NES/SNES days but the resolution we started in turned out to be too high to communicate that and too hard for me to fill up. It became too detailed. More so, the clear ‘broad areas of untextured colour’ style I used began to show its weak spots. We decided to cut the game’s resolution in half. This meant that I got only half a screen to fill and pixels would look even bigger in the game because it would always be rendered full screen. That meant Willy had to be redrawn in half the size. It gave me a chance to adjust some things and etch his personality even more. There was less room for detail so only the traits that really mattered would make it through. Gone were the buckteeth and while I was at it I tried out some other ideas. The one I settled on had red hair and a blue shirt. It was just the simplest figure and felt the most ‘retro game icon’ to me. Also a striped shirt might prove more work to animate later on. I was content with what I had until halfway into the project when we decided it might be a good idea to refine the design. The idea was to make him less square and more round. That’s when I came up with this. This is Willy’s final form. Don’t you just want to give this kid a hug? He needs it. An idea that runs through the whole game is that the story of Willy is like the bible story of Job. A man whose faith was tested by God pouring a seemingly endless barrage of misery over him. 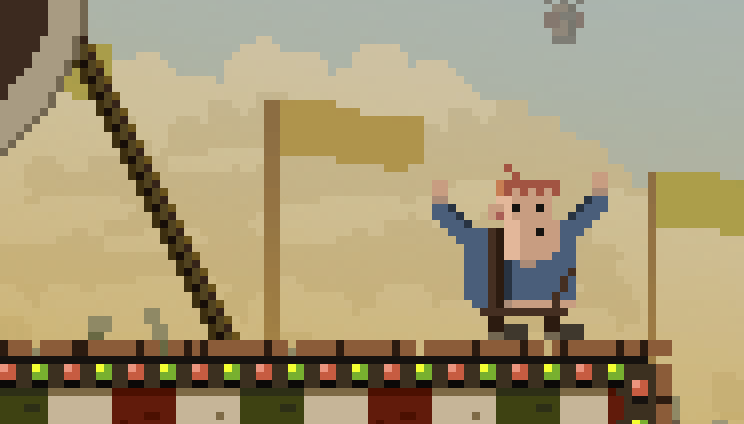 God wanted to see when Job gave up, Penarium wants to see when the player gives up. We’re not just throwing around analogies here. I’ll get more into this in a later post. 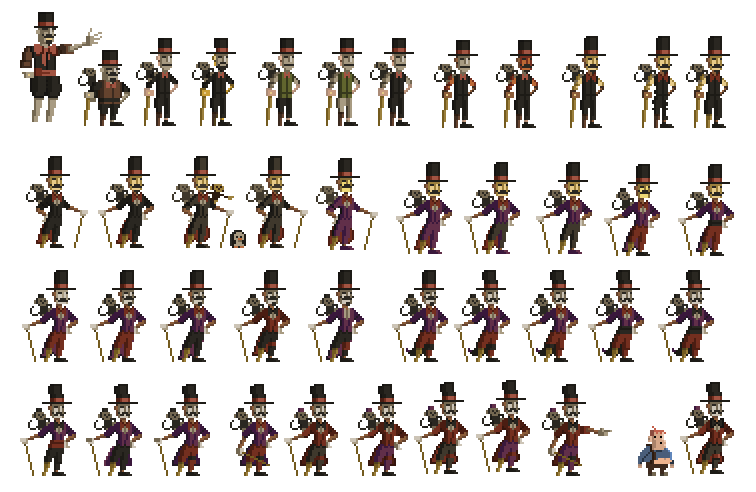 Being almost the only two characters in the game I wanted a contrast between Willy and The Director, which during development I called Gonzo, though that is not his name in the game. On first sight The Director is everything Willy is not. He is the clear enemy and he is nothing like the player (Willy), Gonzo talks, Willy is quiet. Gonzo is tall and thin, Willy is short and broad. Gonzo has to look like obvious bad news so the cutscenes where Willy blindly follows him become even more frustrating. Where Willy was easy to design the Director was hard. I struggled with the director because it was very hard for me to not make him look like V For Vendetta’s Guy Fawkes. The trademark signs of a circus director or ringleader are a long suit and a top hat and often a moustache. Add to that the required (boss’s orders) mask and it’s hard not to think of Guy Fawkes. I tried working without a moustache but that seemed to give the whole character less menace. I like him as a character but I have to admit most of his appeal stems from the resemblance to Guy Fawkes. It needs to be said that Gonzo was designed much later into the project than Willy and I had less time to work him out. I am curious after what would come out if I decided to redesign the character. Character design is fun to do and having as much time as I did for designing Willy helped a lot. There are three more characters I’ll discuss in the future. One whose role was in the end reduced to a mere detail, much to my sadness. 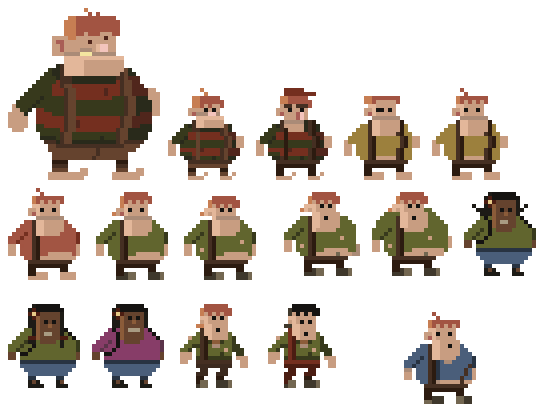 All that and more will be revealed in the following parts of Behind The Art Of Penarium. 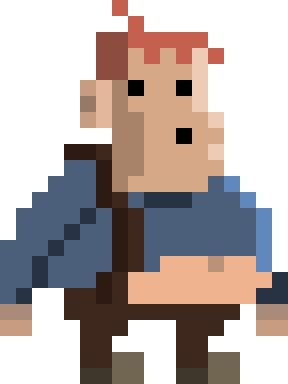 Did I mention Penarium is out?